Too busy to deal with kombucha? Try this low-maintenance alternative. NOTE: This is 1 of 2 drinking vinegars I’ve made this summer. See the other one — a Spiced Stone Fruit Shrub here. I love fermenting fruit (see here and here), both for the natural preservation methodology but also for the health benefits. “Pre-digesting” the sugars via fermentation makes the nutrients so much more accessible for who have candida, yeast overgrowths, and for those of us who just plain do better on the lower end of the carb spectrum. So when “shrubs” (otherwise known as drinking vinegars) started making an appearance all over the place in Portland, the combo of fruit AND apple cider vinegar AND fermentation totally hooked me. I have been buying them (Suja makes some good flavors) due to already having so many ferments going all the time over here. But they are not fizzy *thumbs down emoji* and all the fruit of summer 2017 had me intrigued to try my hand at it at home. I scoured lots of resources and recipes on shrubs. It seems that people are not capitalizing on the ability to do a 2nd ferment (much like the kombucha process) to get a shrub soda and it’s truly a shame! While I do use the shrubs to sip on with some morning warm water upon waking (instructions below in the recipe), I am loving the lightly sweet, mildly tart sodas that come from running the shrub through a second fermentation process. It’s a nice break from the intensity of kombucha, as well as a chance to get a different probiotic profile into your diet. And it’s SO EASY. Like any ferment, it simply requires a little patience. If kombucha home-brewing stresses you out, you’re going to want to give this a try. I recommend using “extract grade” or “split” vanilla beans for this recipe, mostly for the savings. A designation of “extract grade” will often mean they are older and drier. So although lesser in flavor, they still work really well for things like vanilla extract (I’ve made my own with this style bean for years now) or even finely grinding them for vanilla bean powder. If they are sold as “split,” it means they grew that way and generally have less seeds inside. They will sell for less due to this “deformity” but they still impart lots of flavor to extracts! Time and patience is key when using these more affordable types. I’ve linked to the ones I buy below. It’s a very easy recipe but make sure to read the instructions thoroughly before beginning. As with all ferments, there is a risk of mold so it’s better to be fully informed before you decide to begin! Stir the apple cider vinegar (begin with just 1 cup ACV) and honey together until the honey is dissolved. This may take a few minutes so set it aside and stir occasionally while prepping the rest of the ingredients. Clean and dry the strawberries. I recommend using a fruit & veggie wash just to be sure nothing is going to compete with the fermentation process. Cut into small pieces and add them to a quart-sized mason jar, along with the rosemary, lemon peel (I use a vegetable peeler for this), and vanilla beans. If you don’t buy the already split beans, be sure to cut down the center to expose the seeds before adding to the jar. 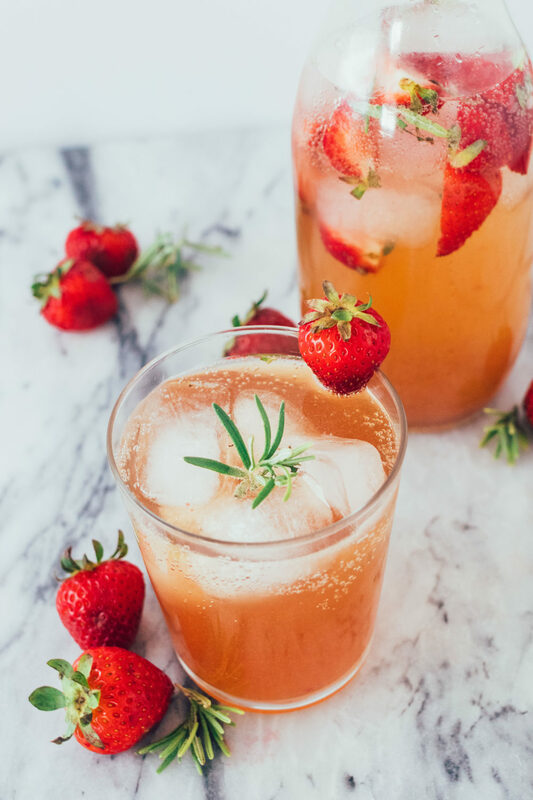 Using a muddler or similar apparatus, press down onto the strawberries until they are very mushy and the rosemary and lemon are a bit broken up. Pour the ACV/honey mixture over top and stir. If there is more than an inch of space left at the top, add additional ACV in until it’s nearer the top and mostly covering the fruit. Cover the jar with cheesecloth and the ring seal (as shown). Coffee filters or even paper towel also work for this. Set in a cool, dark-ish place (anywhere away from direct sunlight is good) where the temperature ranges from 65F-75F ideally. Leave for 30 days, checking every couple of days near the beginning to stir and tuck any fruit under the liquid. Both apple cider vinegar and honey are great preservatives so if you are diligent in tucking the fruit under near the beginning, you shouldn’t experience any mold issues. The surface will darken slightly but that’s normal. The shrub can be left at room temperature nearly indefinitely due to how slow the ferment happens. If you do not wish for it to continue to ferment (since there’s a very gradual decrease in sweetness with this process), you can store the shrub in the fridge. Add 1-2 teaspoons to 8 oz. warm water right after waking. Add a 1+ tablespoons of shrub to your bubbly beverage of choice (I use LaCroix or Target’s Simply Balanced sparkling waters). Keep in mind that if your added beverage is unsweetened, this will not be a very tart/not-sweet drink. Start a 2nd ferment with the shrub as a base. Directions: add the shrub, fruit juice, and filtered water to the jar. Seal and gently invert to shake the ingredients together. Leave on the counter for 7+ days to ferment and get fizzy. You will want to check on it after 2 days to “burp” (open to release gasses). Continue to burp every day thereafter to prevent the internal pressure from building too high. Taste after 5 days to gauge the sweetness and level of fizz. Leave fermenting longer for less sweetness and more tart flavor. Note: similar to kombucha, you can save some of the 2nd ferment to create new on-going brews, but while it will be probiotic in nature, the ACV content/benefit will diminish with each consecutive brew.